is proud to launch its new imprint with a full colour illustrated publication on the internationally acclaimed ceramic artist David Roberts. Trade Orders - please download the order form, print it out, fill it in and send it in the post with your cheque. David Roberts is one of the most significant ceramic artists working in Europe today. A distinguished English potter, he has a worldwide reputation as a leading practitioner in Raku ceramics: a technique with its origin in small-scale vessels made in late sixteenth-century Japan. Roberts is acknowledged as responsible for the introduction and promotion of modern, large scale Raku in Britain. He has also been instrumental in its re-introduction to the United States of America, where his example has played a key role in the foundation of the ‘Naked Raku’ movement. In his personal exploration of this traditional technique, Roberts has transformed it into a vibrant and contemporary art form. 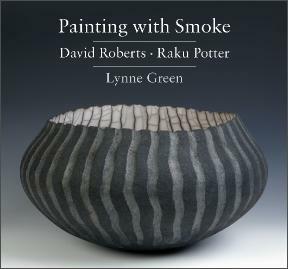 Since the first edition of this book the phrase ‘painting with smoke’, coined by David Roberts, has become part of the lexicon of Raku ceramics. The only publication on this important ceramic artist, this expanded second edition discusses the developments of the last decade and highlights Roberts’ increasing stature as an international figure in contemporary ceramics. There is also a new and substantial technical section, which describes his working practise in an open and accessible way. Lynne Green was educated as an art historian at Sussex University and the Courtauld Institute of Art, London. Having been employed in the organization of exhibitions at the Hayward Gallery, London and the running of a public art collection in Southampton, she became a freelance writer /curator in the early nineteen nineties. Subsequently she co-founded and was later editor of the magazine Contemporary Art. As an author she has specialized in British modernism and contemporary art. Her books include Yorkshire Sculpture Park: Landscape for Art, YSP 2008, and W. Barns-Graham: a studio life, Lund Humphries 2001. This is her first book on a ceramic artist. In 2008 she embarked on a new career as a publisher.